Prattley is the world leader in light weight animal handling equipment, using cutting edge technology. 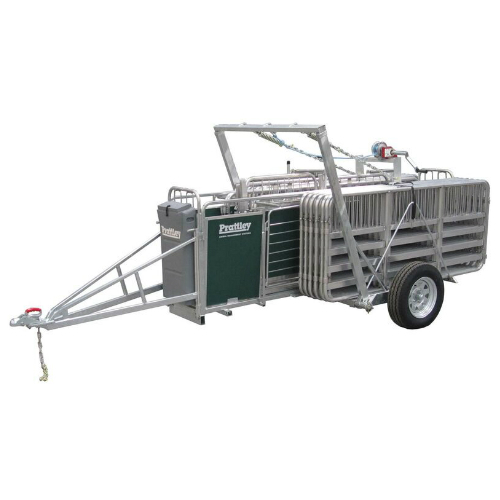 Prattley’s prime aim is to produce quality sheep handling equipment such as mobile sheep yards that helps you to attain maximum efficiency. Despite its light weight, Prattley’s sheep yard can be towed by almost any vehicle including quad bikes, and can be easily set up. Prattley sheep equipment is sturdy and long lasting, built to withstand the toughest treatment your stock can dish out. Prattley’s mobile sheep yards can be easily transported, assembled and operated, by one person. This sheep yard is versatile and can be taken anywhere on the farm for on-the-spot drenching, dosing, shearing, tagging, docking and any general animal treatment. The mobile unit allows the operator to utilise the direction of sunlight and wind to ensure a natural stock flow through the yard. This gives practical results such as faster animal flow, saved time and travel, reduced fuel and labour costs, lower risk of infection from dusty tracks, less stress on the animal etc., therefore maximising farm management. Larger yards are available on request. For more information visit https://www.odonovaneng.ie/product-category/agriculture/sheep/prattley/ to see our range of Prattley equipment or call us on 021-7334066 we will be happy to answer any queries you may have.